Ryan Traster is a Minneapolis-bred singer/songwriter currently residing in Portland, but the restless troubadour has spent the better part of the decade traveling the world making music on stages and in studios. He has had the privilege of recording or performing with members of The Jayhawks, Golden Smog, and Jonathan Wilson. He was also a key member of Small Towns Burn A Little Slower, a Minneapolis buzzband that made a mark on the emo/post punk scene in the mid 2000's. Chris Pureka has been touring the US for the last 10 years and Europe the last three, performing unadorned, country-inflected folk music at cozy clubs and grand theaters, grassroots festivals and urban block parties. She had criss-crossed the states sharing the stage with such artists as the Lumineers, Sera Cahoone, and Y La Bamba. Pureka's latest release, Chimera II, is an expression of transition, collecting seven tracks old and new, borrowed and original. Like its predecessor, it's both a coda and prelude, an assortment of songs that are vital and revealing and yet don't quite fit within the focus of her full-length albums. 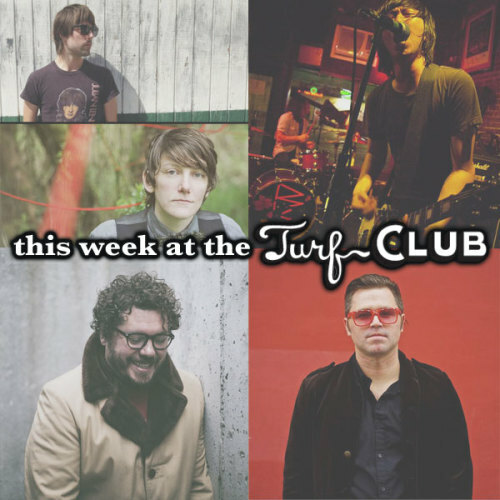 WEDNESDAY: ACTUAL WOLF "Tape Release Show"
Opening up Wednesday's show will be Turf Club favorites, The Cactus Blossoms. “It's all better on the other side,” guitarist and lead singer Abisha Uhl cries on Anthem, the new EP by Twin Cities rockers Sick of Sarah. Evidence of the band's cohesiveness, born out of ten years playing music together, is all over the album. In Sick of Sarah, everyone sings, keeping Uhl's clear melodies afloat on a sea of “whoa's” and “ahh's.” Meanwhile, Forsythe moves her drums from thundering to stuttering, Uhl and Murphy and Farmer keep their guitars set to “blistering,” peppering in rhythms that adds subtle sense of structure and urgency. The band's Place Your Bets Tour makes its Twin Cities stop this Thursday at the Turf, with tour-mates George Morris and local trio Strange Relations filling out the three band bill. FRIDAY: An Evening With BOBBY BARE JR.
Bobby Bare, Jr. could've phoned in a career. He could've exploited the fact that he's the son of iconic Country Music Hall of Famer Bobby Bare, was born into Nashville's Music Row elite, and counted artists like Shel Silverstein as close family friends and George Jones and Tammy Wynette as next door neighbors. Instead, Bobby blazed a path of unique songwriting craftsmanship with a voice that blows through you like an unyielding wind on the desolate prairie. Undefeated is BBJ's first release since 2010 and what he calls his "break-up record," but the whole of it is much more involved: this isn't escapism; it's an emotional survival guide. Undefeated is ten songs of reality checks, clever wordplay, and daring arrangements, the aural companion to that buddy who pulls up a bar stool next to yours to help soak away your sorrows. Since their debut in 2005, the Minneapolis-based duo of Matthew Kazama and Hideo Takahashi has excelled at tossing elements of late-'90s mathcore and classic Reagan-era punk against the wall with disarming power and impressively fresh results. This Saturday at the Turf, the band will be celebrating the release of their latest record, Spin the Bottle : Adult Party (now available on Bandcamp and iTunes), and their 10 years of existence together as Birthday Suits. Following Wednesday's tape release show with The Cactus Blossoms, Eric Pollard will relocate downstairs to kick off a Sundays in May residency in the Clown Lounge. Doors for the shows open at 8pm and will feature a solo Actual Wolf set, along with a set from a different special guest each week. To coincide with these Clown Lounge shows, there will be a free movie screening each week upstairs on the main floor (movies will start at 7pm). Pollard hand-picked the slate of films that will be shown, starting this week with the 1994 John Waters dark comedy, Serial Mom. This Sunday's special guest in the Clown Lounge is expected to be announced at the Wednesday Actual Wolf show. Daikaiju (die-kie-joo) Who is the Daikaiju??? Premium action heroes deliver most high rocket music! Special reverb skill combo for full impact! Loud sonic boom for earful pleasure! Beautiful radiation of hyper-dimensional springy sound creates divine psychic wind for your special protection. Worship Psycho-surf band Daikaiju daily for good luck and health!